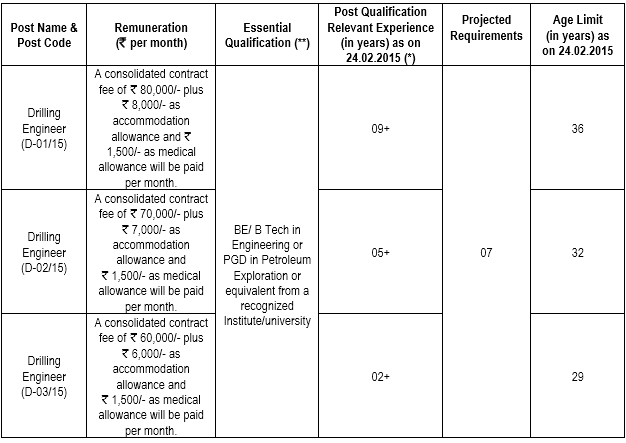 Oil India Limited intends to hire Drilling Engineers on contract basis purely for temporary requirement through a walk in interview. The contract would be for about a period of two years, initially for a period of six months, extendable by another three six months term, depending upon requirement and the performance of the individual. The above posts are purely temporary and the incumbents against these posts will be engaged on contract basis initially for a period of six months, extendable further on six monthly basis for a maximum period of 02 years depending upon the requirement and performance. The engagement will not confer any right on the candidate for regularization in OIL. How to apply: Candidates meeting the above criteria may appear with original mark sheets, certificates and photocopies of the same and 2 passport size photographs for a walk-in interview. More details can be seen here at : Advertisement .